A fruit salad is the perfect gluten free side dish to share at any event. Save money and enhance the flavor by purchasing more of the fruits that are in season. Enjoy! Enhance the life of your produce with this simple guide. This is a delicious, easy way to cool off on hot summer days. Enjoy these great home-style, fresh mashed potatoes. You will never be able to eat potatoes from a box again! 1. In large sauce pan, fill 2/3 with water, bring to boil. 2. While water is heating; clean, peel and cut potatoes into cubes. Add a dash of salt and potatoes to boiling water. 3. Cook for 15 min on high or until fork is able to enter and exit potatoes easily. Drain well. 4. In large saucepan, add heavy whipping cream, butter, salt to potatoes. Smash with meat smasher or fork until light and fluffy. Add salt and pepper to taste. Be sure to add potatoes to boiling water to prevent potatoes from becoming soggy. For a creamier consistency add additional whipping cream and butter. We enjoy some skin on our potatoes, so we only peel the brown potatoes and keep the red potatoes skin on. Feel free to peel the potatoes however you desire. See quick tips on dining gluten free with relatives and friends. This is my favorite dish for any occasion. This dish always goes fast, and I never have leftovers to take home. Even my gluten-eating friends make this recipe for events and family dinners. 1. Preheat oven to 350°. Grease 9×13 pan with cooking spray or butter. 2. In large bow, add all ingredients except toppings, mix well. 3. In small bowl, add corn flakes and 1/4 cup melted butter, mix well. 4. Add cheesy potato mixture to prepared pan, spread evenly. Sprinkle with corn flakes toppings mix. 5. Bake for 30-60 min, or until top becomes golden brown. Please note: cooking time depends on how defrosted the hash browns are. Defrosted hash-brown’s mix takes around 30 min, while frozen hash-brown’s mix takes around 60 min. 1. Grease large crock-pot with cooking spray or butter. 4. Add cheesy potato mixture to prepared crock-pot, spread evenly. Sprinkle with corn flakes toppings mix. 5. Bake on low for 3 1/2 hours. Turn on high for the last 1/2 hour and cook until top becomes golden brown. This dish makes great left overs, but for families of four can make a half portion of this recipe. Simply use only half the amount of requested ingredients in a 8×8 pan. Then just follow the cooking directions above as directed. 1. In large microwave bowl melt margarine on high 1 min. 2. Stir in salt and sauce. Add Chex, pretzels and nuts. Mix until coated. 3. Cook on high 6 min. Stirring every 2 min. Spread on paper towel to cool. Store in airtight container. 2. In small microwave bowl, melt margarine. 3. In huge shallow roasting pan (15x10x2) add melted margarine, salt and sauce. Stir together. Add Chex, pretzels and nuts. Stir until all pieces are coated. 4. Heat in oven 1 hour. Stir every 15 min. Spread on paper towel to cool. Store in airtight container. 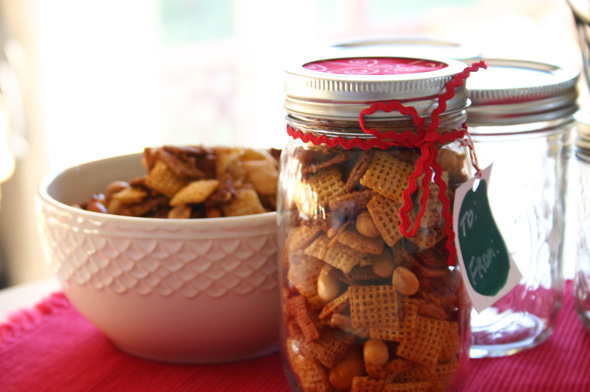 Mix up you’re traditional gluten free Chex mix with this tasty caramel recipe. This light, refreshing cheesecake is unlike any cheesecake you’ve had before.